Looking for healthy giardiniera that just uses olive oil? Look no further - we've got the list of the best olive-oil giardinieras. These will, obviously, have stronger olive notes, but we find that to be a pleasant bonus. Giaridniera is often made with soybean, vegetable, olive and/or canola oil (or a mix of those). It can be difficult to find giardiniera made exclusively with olive oil because the other oils are better at preserving giardiniera, so the shelf life is longer. But there are still quite a few great olive-oil-only options if you don't like (or are intolerant to) soybean or other veggie oils. Here's our favorites. They had us at first bite. I mean, we're floored by this giardiniera. They just started making it about 5-6 years ago but we think they've already reached perfection with it. They make and bottle it in their neighborhood butcher shop in Dunning. The extra virgin olive oil gives it a pronounced olive flavor that is balanced nicely with a pleasant celery taste. It's a bright, crisp giardiniera that leaves a nice, lasting impression in your mouth. The heat comes right at you, but it's not overwheming. It's a respectable 6.5/10. They have a mild version which is just as delicious. Where to Buy It: You'll have to visit their amazing butcher shop and deli at 7101 West Addison to pick this up. Be sure to load up on fresh sausages and their homemade Italian Roast Beef while you're there. More information: Check out our full review of Joseph's Finest Meats. Gio's is nestled in the South-Side Chicago neighborhood of Bridgeport at 2724 South Lowe Avenue and run by people who really love food. They use whole green olives on top of a quality olive oil, so it has a lovely olive flavor ringing throughout it. 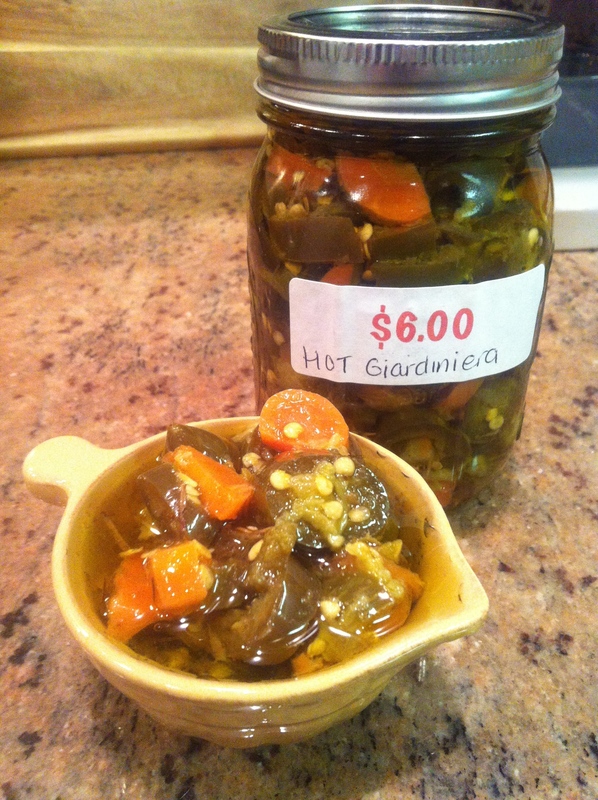 Spice-seekers will also respect this giardiniera - it gets a 7.5/10 on the heat scale. Grab the mild version if you're not a big fan of heat. This is a winner every way you look at it. The vegetables have a satisfying crispness and include olives, red peppers, olive oil, jalepeño peppers (hot version only), celery, carrots and green peppers. 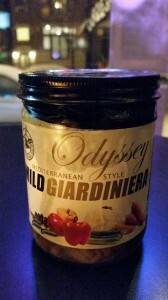 Where to get it: Sadly, Gio's doesn't ship their giard out, so you have to go to their Chicago restaurant to pick up your own jar. It's certainly worth the trip to grab a bite and load up on their giaridniera. More information: Check out our full review of Gio's. We eat the heck out of this giardiniera. I mean, we really eat a lot of this stuff. They use top quality ingredients and mix in bright, fresh, interesting spices that really wake up your taste buds. 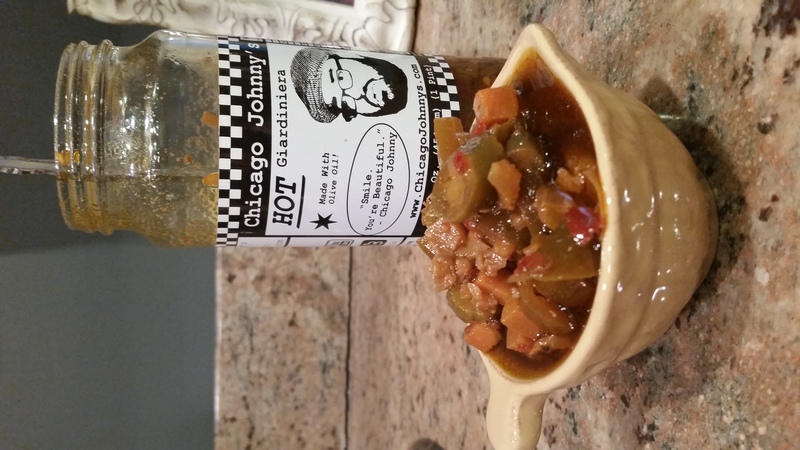 The spices in this blend give this giardiniera a depth we really covet. Particularly, they use a fresh, high quality blend of garlic, onion powder and paprika that gives this giardiniera a unique twist. The paprika gives it a hearty red tint and a smokey flavor reminiscent of your favorite chili. They use high quality olive oil that's actually made with olive pomace, which is the last pressing of the olives. It gives it a crisp, clean, non-greasy taste that rolls nicely in your mouth. The vegetables include peppers, carrots, cauliflower and red bell peppers and they all have that nice paprika hue to them. It's festive looking mix that's as tasty as it is pretty. Where to Buy It and Price: $6.95 for a 16 ounce jar on Amazon or you can usually get it for cheaper on his website. More information: Check out our full review of Chicago Johnny's. It ain't your gramps' traditional giardiniera - this is much healthier version of giaridniera that's bright, crisp and super tasty. It's made with olive oil and raw, unfiltered apple cider vinegar (super duper healthy stuff!). The veggies include jalepenos, celery, cauliflower, carrots and onions. Lauren (aka "Lu") jokingly and lovingly calls it her "hippy giardiniera". Well, slap some patchouli on us and call us Jerry - we are super fans of this stuff. Heads up that it only lasts a few weeks in the fridge, but that won't be a problem for you - we're pretty sure you'll go through these tubs fast. Ingredients: Olive oil, raw, unfiltered apple cider vinegar, carrots, celery, hot peppers, bell peppers, cauliflower, garlic, oregeno, sea salt and spices. Where to Buy It: You can find Lu Style locally in Colorado grocery stores and farmers markets or you can buy it right on their website. Price: Two 12 ounce jars are $22. 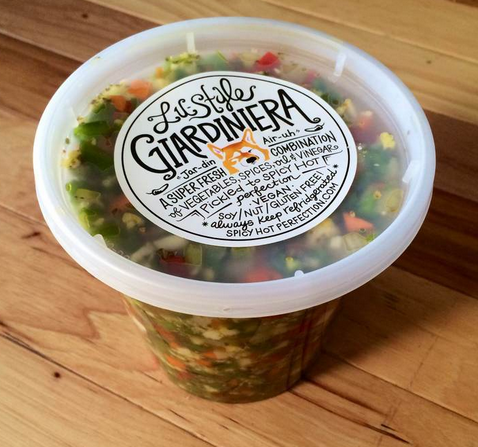 More information: Check out our full review of Lu Style Giardiniera. This Edison Park neighborhood deli is over at 708 North Northwest Highway in Chicago. We know a bunch of people who make special trips here to stock up on their giard (and sausages). They make a clean, crisp giardiniera. It's evident they use a top tier olive oil and a high quality vinegar. Upon your first bite, you experience a slight, immediate tanginess. After that first vinegar note, a pleasant celery and olive flavor lingers for a little bit in your mouth. Their ingredient list includes bell peppers, olive oil, celery, cauliflower, carrots, pitted green olives, spices, vinegar, salt and lactic acid. The label also states it may contain potassium sorbate, sulfites, benzoate as preservatives. Important note: The mild giaridniera is the only kind that is olive-oil exclusive. 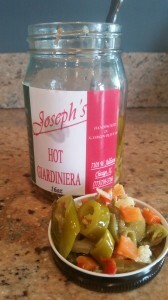 Their hot giardiniera and hot pepper spread both use soybean oil. Ingredients: Bell peppers, olive oil, celery, cauliflower, carrots, pitted green olives, spices, vinegar, salt, lactic acid. May contain potassium sorbate, sulfites, benzoate. 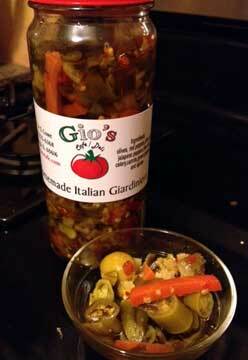 Where to Buy it: Get it at their store -- OR -- they ship their giardiniera to anywhere in the United States. Call 773-631-0055 to place your order. 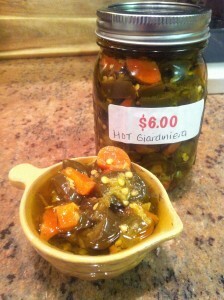 Prices: $5.49 for a 32 ounce jar of giardiniera and $4.99 for a pint of hot pepper spread. More information: Check out our full review of Tony's Deli and Subs. Pete's Fresh Market grocery stores makes their own giardiniera that we really like. They use only olive oil in their hot mix (heads up that their mild version uses other vegetable oils). Their thin, rolling oil gives you a clean mouthy feel. The vinegar and lactic acid they use leaves subtle ring of flavor behind - very well done. The veggies have a consistent crunch to them and overall it's just a very pleasant giard. About a 6/10 on the heat scale. These bottles hold hot peppers, extra virgin olive oil, celery, bell peppers, carrots, pitted green olives, spices, vinegar, salt and lactic acid. The label also says "may contain potassium sorbate, sulfites, benzoate". 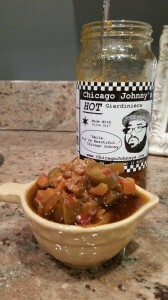 Where to Buy It: They don't yet sell their giardiniera online, so you can to go to one of their Chicagoland stores to score a bottle, however, they've had production problems and we haven't seen a jar in their stores for a while. The Western and Madison avenue store (2333 W. Madison Street) told me their giardiniera will be back on the shelf on 3/4/15, however I don't think that's the case for all the stores. For example, I just called the store at 5724 S. Kedzie Avenue and they said they stopped making the giardiniera a year ago. So, there's conflicting info here and corporate still hasn't gotten back to us. If you love it (and we do), we suggest bombarding the Western and Madison Ave store on the 4th and stocking up. 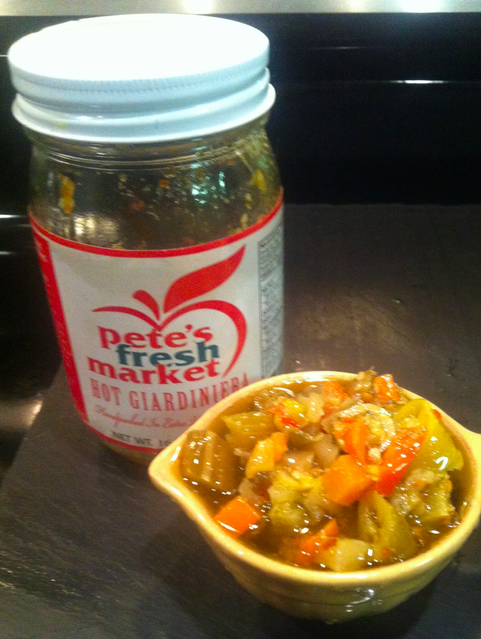 More information: Check out our full review of Pete's Fresh Market giardiniera. Dec 2017 UPDATE: Just got word from a fan named Jenny that their blend is actually an olive oil AND soy blend. They either changed their recipe since we tried them out or we got it wrong the first time. Sorry for any confusion! Olive lovers rejoice - this could be your go-to giard. They use green and kalamata olives, which is pretty rare. They also add capers to their mix. This blend has a salty tanginess to it that is really satisfying. There's very little heat in the mild. We have yet to try to the hot version, but will be running to the store soon to pick it up. Ingredients: Mixed bell peppers, extra-virgin olive oil, yellow bell peppers, vegetables, red peppers, kalamata olives, pepperoncini, green olives, capers, mild spices, vinegar, salt, lactic acid. May contain potassium sorbate, sulfites, benzoate. Where to Buy it: Available at Brookhaven Marketplace, which has three stores in Darien, Burr Ridge and Mokena, Illinois. More information: Check out our full review of Odyssey Giardiniera. 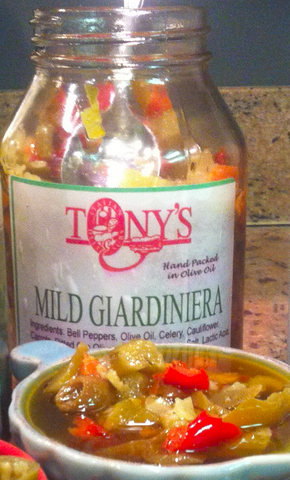 This Italian grocer and deli in the Dunning neighborhood of Chicago makes some yummy giardiniera. If you're into softer veggies and delicate vinegar flavors, this could quickly become one of your favorite giardinieras. They don't list ingredients on their Mason jars, but we know it's an olive oil base and they have bell peppers, serrano peppers, carrots, vinegar and spices. It's difficult to detect exactly what spices they have going on in this floral mix, but the most prominent one we can identify is oregano and we suspect there's a good amount of garlic in there too. The heat level is a respectable 7 out of 10. Ingredients: They don't list ingredients, but we know it's an olive oil base and they have bell peppers, serrano peppers, carrots, vinegar and spices. 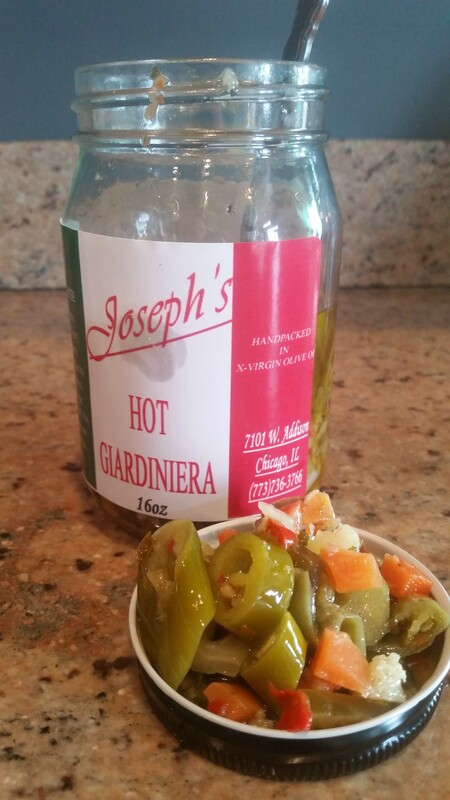 Where to Buy It: You can only get this giardiniera at their store and deli, which is located at 3220 North Harlem Avenue. Pick up a couple subs while you're there, you'll be happy you did. More information: Check out our full review of Riviera's Hot Giardiniera. We're still scouring the country looking for more tasty olive-oil only hot pepper mixes. We'll update this list if we taste new ones and they make the cut. Do you have a favorite olive oil based giardiniera that's not on this list? Shoot us an email, we'd love to try it out. These giards wil congeal fast in the fridge when chilled and expire faster (an opened bottle will typically only "stay fresh" for 2-3 months in the fridge, versus 5-6+ months for giards with other oils), but most people go through a jar in that time anyway, so it's not usually a problem. For the congealing issue, just pull the jar out 10-15 minutes before use so it thins out at room temperature when you need it (or run it under warm water for a few minutes prior to use).